All current justices in the New Mexico Supreme Court are graduates of the UNM Law School. 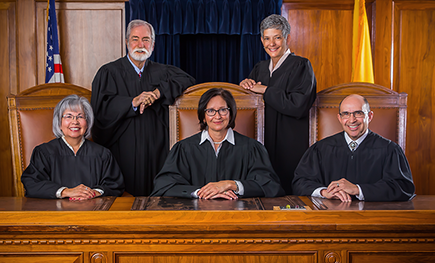 Front row, l-r: Justice Petra Jimenez Maes (’73), Chief Justice Barbara J. Vigil (’85), Justice Edward L. Chavez (’81). Back row: Justice Charles Daniels (’69), Justice Judith Nakamura ('89). The UNM School of Law has trained many of the state’s, region’s, and nation’s most influential leaders, including all of the current New Mexico Supreme Court justices. The UNM Law School thanks these distinguished alumni for their service to our state and for their generous and unfailing support of their law school. "The UNM School of Law is a shining jewel in our legal community. My time at the law school not only provided me with an outstanding legal education and a development of the skills I needed to embark upon my professional career, but it also strengthened my commitment to public service. The long-standing personal and professional relationships I formed as a law student continue to be a source of wisdom, support, and encouragement to me." "From my first day of class almost 50 years ago until now, the UNM School of Law has been an important part of my life. Choosing this extraordinary school for my legal education is clearly the best professional decision I have ever made." "Being a graduate of the UNM Law School means being part of a wonderful legacy of generations of lawyers who have committed their professional career to working in our small and close knit New Mexico legal community. Like all of my respected colleagues, attending UNM uniquely prepared me for the challenges associated with serving the judiciary. I remain grateful to the law school faculty for the superior educational experience that has shaped my career." Chief Justice Barbara J. Vigil (’85) was elected to the New Mexico Supreme Court in November, 2012 and in 2014 she was chosen by her colleagues to serve as Chief Justice. Prior to her election to the New Mexico Supreme Court, Justice Vigil served as a district court judge in the First Judicial District Court. Justice Vigil was the Children’s Court Judge for ten of her twelve years on the trial court bench and helped garner public resources to sustain community programs for at risk youth throughout New Mexico. She also led efforts to examine ways to improve the adverse disproportionality of minority youth in the juvenile justice system and has been recognized locally and nationally as a leader in the development of comprehensive strategies designed to improve the juvenile justice system in New Mexico. During her final two years on the district court, she presided over the civil docket and also served as Chief Judge. Justice Vigil has served on numerous legal and civic boards and commissions. She currently serves as the Supreme Court’s liaison to the New Mexico Tribal-State Judicial Consortium and the Committee for the Improvement of Jury Service. Justice Vigil enjoys facilitating visits by international legal scholars, judges and elected officials to the Court. Justice Petra Jimenez Maes (’73) was elected to the Supreme Court in November 1998, becoming the first Hispana to serve on the court. On January 8, 2003 she was designated by unanimous vote of her colleagues to serve a two-year term as Chief Justice, ushering in a new era as the first Hispanic Woman Chief Justice of the New Mexico Supreme Court. She was again unanimously voted to serve a second two-year term as Chief Justice in April, 2012 becoming the first woman to serve two terms as Chief Justice. Prior to joining the Court, Justice Maes served as a district court judge in the First Judicial District, including four years in the criminal division, six years in the family division, seven years in the civil division, and twelve years as the Children’s Court judge. She is a tireless leader in efforts to improve court processes and procedures in child abuse and neglect cases as well as in the adoption and foster care systems. She is also recognized for her commitment to improving access to justice for all New Mexicans. Justice Maes serves as the Court’s liaison to numerous boards and commissions, including JIFFY which is the Supreme Court committee that oversees court automation and technology. Her work on JIFFY has significantly improved the efficient operation of courts throughout New Mexico. Justice Edward L. Chavez (’81) Born in Santa Fe, Justice Chavez was appointed to the Supreme Court by Governor Bill Richardson and has served on the Court since 2003, including just over three years as Chief Justice. He is a member of the American Law Institute, and is an elected Fellow in the American College of Trial Lawyers, the International Academy of Trial Lawyers, and the Advanced Science and Technology Adjudication and Resource Center. He is an adjunct professor at the UNM School of Law and is the Court’s liaison to a number of committees, boards and commissions, including the Board of Bar Examiners, the Disciplinary Board, and the Alternative Dispute Resolution Commission. Justice Chavez has skillfully led the Court’s innovative language access efforts which have received national recognition. The deep and longstanding respect he has garnered from diverse sectors of the bar is a testament to his leadership and commitment to the improvement of the judiciary and the legal profession in New Mexico. Justice Charles Daniels (’69) was appointed to the Supreme Court in October 2007 on recommendation of the nonpartisan Judicial Nominating Commission and ran unopposed in the 2008 primary and general elections. He served as Chief Justice between 2010 and 2012 and is expected to be selected by his fellow Justices to serve a second two-year term as Chief Justice beginning in April 2016. During his 38 years as a lawyer, Justice Daniels served as a tenured professor at the UNM School Law before returning to an active courtroom practice that encompassed a wide range of civil and criminal cases not only in New Mexico but also in a number of state and federal courts from Hawaii to Puerto Rico. He is a recipient of the National Trial Advocacy Teacher of the Year Award and is a well sought after speaker and presenter both in New Mexico and nationally on a number of topics. In addition to being the Court’s in-house historian, Justice Daniels is a skilled and passionate advocate on behalf of the Supreme Court in its efforts to improve the administration of justice throughout New Mexico. Justice Judith Nakamura ('89) is the newest member of the Supreme Court and was appointed to the Court in November 2015 by Governor Susana Martinez. Justice Nakamura has served the Judiciary for seventeen years, including over fourteen years as a judge in the Bernalillo County Metropolitan Court and more than two years as a district court judge in the Second Judicial District, where she presided over criminal cases. While on the Metropolitan Court bench, she was elected by her colleagues to serve an unprecedented four terms as Chief Judge. As Chief Judge she was responsible for overseeing Metro Court’s day to day operations and its $22 million dollar budget. She has been recognized as a leader in the development and implementation of innovative court programs to reduce recidivism in DWI cases. The Supreme Court consists of five Justices who serve eight-year terms. The extensive responsibilities of the Justices reflect their collective role as the highest court, and court of last resort, in the state of New Mexico with the duty to oversee the entire New Mexico Judiciary. The Supreme Court’s mandatory, exclusive appellate jurisdiction includes capital appeals, appeals from the Public Regulation Commission, and appeals in election challenges. The Supreme Court also has the sole discretionary, appellate jurisdiction to review decisions of New Mexico Court of Appeals through the issuance of writs of certiorari. The Supreme Court’s original jurisdiction includes the power of superintending control over all lower state courts, and the power to issue extraordinary writs such as mandamus, prohibition, habeas corpus, and other writs necessary and proper for complete exercise of the Court’s jurisdiction. In addition to its regular caseload responsibilities, the Court is responsible for the statewide administrative oversight of the entire Judiciary, which includes the promulgation of rules of practice and procedure and the appointment and oversight of over 40 committees, boards, and commissions who assist the Court with its supervision of the bench and bar. The Court also is responsible for the admission and regulation of attorneys and judges, which includes setting and enforcing the requirements for the continuing legal education of attorneys and judges and imposing discipline against attorneys and judges for professional misconduct.